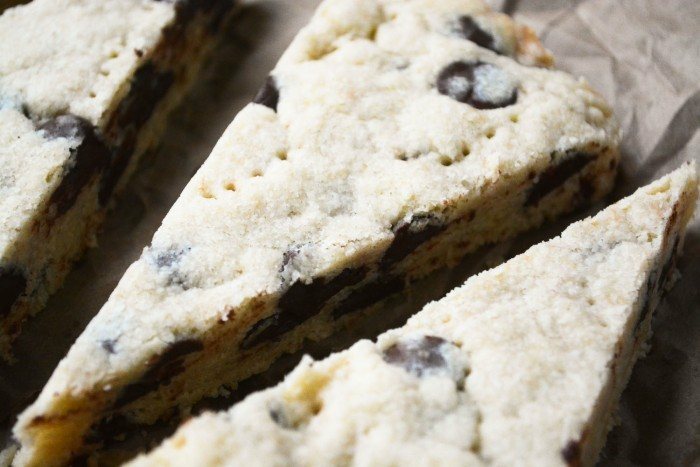 Bittersweet Chocolate Chip Shortbread ~ this classic buttery shortbread studded with chunky bittersweet chocolate chips melts in your mouth! Put the flours, sugar, and cornstarch in a large mixing bowl Whisk to combine everything well. Toss in the chocolate chips, and then pour in the butter, mixing as you pour. Stir the dough together until there is no more dry flour left. The dough will be crumbly, but will hold together when pressed. Press the dough into a 9 inch round tart pan, with a removable bottom, there's no need to grease it. You can also use a regular round or square baking pan, 8 or 9 inches. Use your hands to flatten it out and get it as even as possible. I like to prick it all over with the tines of a fork. Bake for about 22-25 minutes, until the shortbread is just getting a slight golden tinge around the very edge. Don't over bake. Let the shortbread cool for about 20 minutes on a rack. I like to slice it while still warm, but be careful, the shortbread will be delicate until it has fully cooled. Do take a taste while it is still warm though, it's pure heaven!